The birth of a child is such a special time and there is nothing like when you become a mom or a dad. And often times when a child is born, as friends and family members, grandparents and godparents, spouses and coworkers, the search begins for that perfect gift that commemorates the birth of a child. With baby photo engraved jewelry and keepsakes, you can gift them a memory that they will treasure and that is personal to their child. The options are endless when it comes to choosing a baby photo necklace or other baby photo keepsakes. Select baby picture jewelry in the form of pendants or bracelets. The pendants include a matching chain and are an ideal way for that new mom to show off her pride and joy. The baby’s photo can also be engraved onto a photo bracelet and the bracelets are adjustable to fit a wide variety of wrists. Don’t forget about dad! 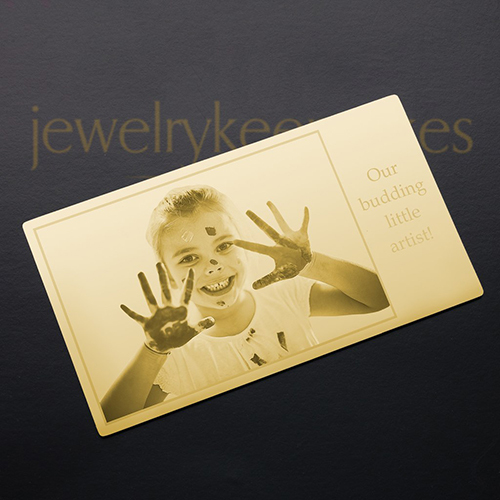 Wallet cards and money clips, keychains and more can be engraved with an image of his tiny princess or handsome prince. Ideal for every dad, baby photo wallet cards and other keepsakes can easily be carried along on day to day travels. Give dad a way to have that picture of his new baby with him at all times. Turn his favorite photo Into a Unique & Exclusive Photo Engraved Jewelry Gift that he will treasure! Let’s face it - parents take a lot of pictures of their baby. From ultrasound photos to family photos to introducing to a close up of your baby’s expression, our master engravers can replicate that exact image. Choose the picture that you love most, the picture that holds special meaning or surprise the grandparents with a photo engraved keepsake of the ultrasound, letting them know there is a new bundle of joy on the way. The back of baby picture necklaces and photo keepsakes can be further personalized with engraved text. Choose a verse from your favorite books such as Goodnight Moon, a phrase or even a particular date that holds special meaning. Depending on the baby photo jewelry that you choose, you can add anywhere from one to four lines of text. Photo wallet cards can be engraved with several lines of text and are a good choice for those that want to personalize with a longer message. See it in full color. Choose a full color baby photo necklace and feel the love! Full color photo jewelry has a white textured background and the texture carries through onto the engraved image. From Photo To Pendant. Create yours here! This allows you to actually feel the image when it is engraved and the ability to feel the edges and ridges adds to the emotional value of the jewelry. There are many reasons why family and friends should choose baby photo jewelry as a gift idea for new parents. Baby picture necklaces are very affordable. The pendants and keepsakes are primarily priced under $50. This makes the necklace within the budget for many families and is an appropriately priced gift. Th gift is highly personal as well. You are getting great emotional return on your financial investment. You don’t need to buy extras! There is no need to go out shopping for extras when it comes to baby picture jewelry. Each baby picture necklace includes a matching chain that measures 20” in length. The jewelry is placed inside a velvet gift box and the chain is placed underneath the velvet platform, allowing for the pendant to be the star of the show. The velvet gift box is then placed inside a high quality white presentation box. Gift wrapping is absolutely free! Time constraints are no problem! Most baby photo jewelry ships within 24 hours of placing your order. Standard shipping in the continental United States is 2-3 days and we offer overnight and 2nd day air. Baby picture necklaces and baby photo keepsakes can be shipped all over the world and all come with our satisfaction guarantee. And grandparents. And aunts and uncles and friends and godparents. We are here to answer your questions and help in any way that we can. We pride ourselves on top quality products and customer service and want to help you choose baby photo jewelry that best captures the love and adoration we have for our children. And the pride and joy we have as parents. A personal grieving gift for those that have lost a child. 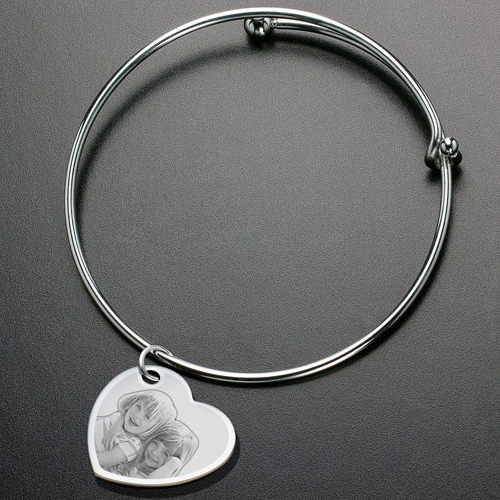 Baby picture jewelry is also available with an internal urn and makes for a touching and personal grieving gift for those that have suffered the loss of a child or any loved one for that matter. Packaged with all the tools necessary to fill and seal, baby picture cremation necklaces will hold a small amount of ashes, a few strands of hair or any personal memento that the parent selects. There are wide assortment of different styles of baby photo jewelry to choose from and each can be personalized to your specifications. Baby photo pendants are available in a variety of finishes including silver, gold and rose gold plated. The pendants are made of stainless steel and can be personalized on the front and the back side of the pedant. 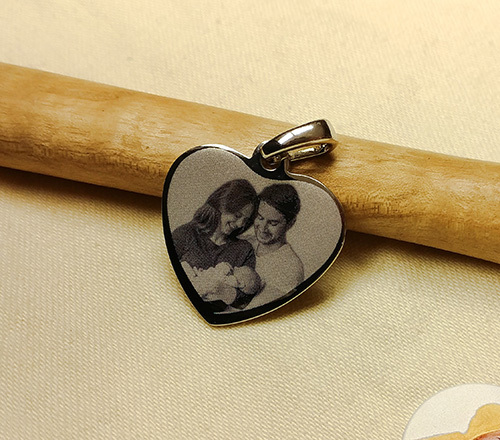 Baby photo jewelry is available with and without an internal urn in the pendant style. Browse our complete selection of Baby Photo Pendants! Choose a baby photo bracelet as a way to celebrate the birth of a child! The bracelets are available in two distinct styles and are made of either .925 sterling silver or stainless steel. The flat keepsake does not have an internal urn and can be engraved on either side. Shop our selection of Baby Photo Engraved Bracelets! Wallet cards are a great gift idea for those that don't typically wear jewelry and are ideal for any member of the family looking to celebrate a life or mourn the passing of a child. Crafted from stainless steel, the wallet cards are available with anywhere from one to four pictures on the front and with a variety of personalization options. Find the perfect photo engraved wallet card for him today! Baby photo jewelry is also available in keychain styles. The keychains come with and without an internal urn and are available in different finishes. A superior gift idea for those that are always on the go, both the front and the back of baby photo keychains can be personalized. 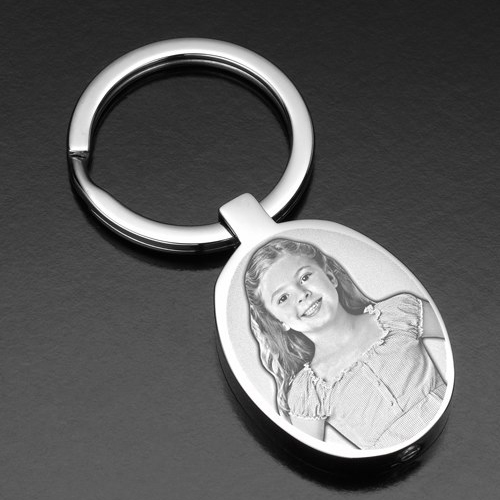 Customize your child's picture on a photo engraved keychain! Baby picture jewelry is the gift that keeps giving to parents. Not only does it provide a way for mom or dad to look back on when their child was first born but baby jewelry and keepsakes provide a personal gift to give to your child later on in their life. Pendants that may no longer be appropriate to wear because the child is older or grown can be hung from a rearview mirror of the car by a ribbon. Pendants and wallet cards can be gifted to a child on their graduation day or when they turn 18 or even when they have a child of their own. Baby picture jewelry and photo keepsakes provide a great visual history for our children and can be passed down from generation to generation. Click here to see a wide selection of our latest and exclusive Personalized Baby Photo Jewelry for new parents!